VANCOUVER , April 16, 2019 /CNW/ - IsoEnergy Ltd. ("IsoEnergy" or the "Company") (TSXV: ISO; OTCQX: ISENF) is pleased to announce assay results for the last drill holes from the winter 2019 drilling program. Drill hole LE19-12 was collared 75m to the west of the discovery section and intersected 8.5m of 3.2% U3O8, 2.1% Ni and 0.2% Co, including 1.0m of 14.3% U3O8 and 1.1% Ni. The final drill hole of the program, LE19-13, was collared 75m east of the discovery section and intersected 2.5m of 0.6% U3O8, 0.2% Ni and 0.5% Co, including 0.5m of 1.6% U3O8, 0.4% Ni and 1.1% Co. 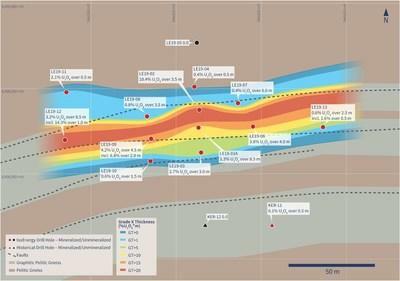 The Hurricane zone is a new discovery of shallow ( 330m below surface), high-grade uranium mineralization on the Company's 100% owned Larocque East property (the "Property") in the eastern Athabasca Basin of northern Saskatchewan (Figure 1). The Company recently completed the first follow-up drilling program after the discovery intersection in July 2018. Eleven of the twelve drill holes in the follow-up winter campaign intersected significant uranium mineralization. Hurricane now measures 150m (long) x 38m (wide) x up to 8.5m thick. The zone is open on all five sections drilled to date and along strike in both directions. The Company, having raised $5.5 million in December 2018 , remains fully funded for a follow-up drilling campaign that is planned for the summer. Craig Parry , Chief Executive Officer commented: "I am impressed by the continued growth of our Hurricane discovery. The thicknesses and grades of these intercepts are consistent with other high-grade deposits in the eastern Athabasca Basin. It is worth noting that Hurricane is in an excellent location, at a relatively shallow depth, not covered by any bodies of water and is within 40 km of the modern, high-grade McClean Lake uranium mill that currently has excess capacity. The team has done a tremendous job in making this discovery and advancing the project and are now eagerly preparing for our summer drill program. Given our strike rate to date – twelve of the thirteen holes we have drilled have hit mineralization – and the nature and extent of the discovery, we are optimistic about being able to deliver more positive news flow in the coming months." Steve Blower , Vice President, Exploration commented: "These 50m step-out intersections confirm the substantial size of the Hurricane zone. We're about to kick off a program of ground DC-Resistivity geophysics that covers the Hurricane zone plus over five km of high-potential strike length extending to the east. These results will be used to help with targeting for a 14-hole, 6,000m follow-up drilling campaign in the immediate Hurricane area planned for this summer and will also aid future exploration efforts further afield."